HAMILTON : The official ribbon cutting ceremony of a bridge in Logan County, built using 100% recycled plastics was held towards the end of May. The bridge was made of ‘Struxure’ building products developed by the New Jersey-based Axion International Holdings Inc. According to the company, 24.6-foot Onion Ditch Bridge is the longest span bridge made from 100 percent recycled plastic materials in North America. County officials are confident that the bridge would be able to withstand heavy loads and would have extended lifetime. 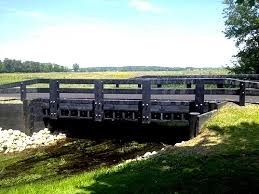 This is the second bridge built using Struxure, the first being the Maine bridge in York area. In addition Axion has earlier built Struxure bridges at domestic US military bases. Struxure is a mixture of 80% post-consumer plastics and 20% car bumpers and dash boards. As per reports, 80% of the cost of the bridge was funded by the Federal Innovative Bridge Research and Deployment Program. Axion is a manufacturer of a wide array of products that make use of recycled plastics and plastic composite technologies.